"I am become Death, the destroyer of appetites"
(J. Robert Oppenheimer, Krishna in the Kitchen, p. 48). Wondering what to serve for that special dinner with family and friends? Bored by Martha Stewart? Rachel Ray outré? Jacque Pépin and Julia Child too mild? Don't want to nuke in the microwave but want to dazzle with a meal that's the bomb? Look no further than How To Make An Atomic Bomb in Your Own Kitchen, 1951's salute to nuclear physics, the Cold War, and Betty Crocker. "Written in an interesting, lucid style, this is an essential book for the millions who want to know the basics of atomics." It's an introduction to molecular gastronomy and culinary physics writ large and long before Ferran Adrià began serving foamed neutrinos at El Bulli or Nathan Myhrvold began publishing Modernist Cuisine. Everything you need to know about building a nuclear bomb in the privacy of the pantry is here. All that's lacking are centrifuges, so tough to find on the open market without clearance from the U.S. Nuclear Regulatory Commission, or a clandestine connection in North Korea. Here's an apocryphal recipe, contributed by an anonymous insider at the Lawrence Livermore National Laboratory. Wearing lead apron and density 4.2 goggles, add ingredients to well-oiled saucepan. Heat to 1,000,000 Kelvins. 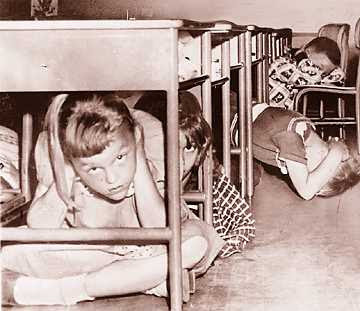 Duck and cover for thirty minutes until vaporized. Serve shadow of fish on platter with a spray of cilantro, al fresco. Fusion cuisine at its finest. Enjoy! Post-priandal fallout will undoubtedly be a dense shower of post-mortem praise, with memories lasting the half-life of your average radioactive isotope. It pains me to admit that How To Make An Atomic Bomb In Your Own Kitchen is light to non-existent on cooking, heavy on education for the 'Fifties justifiably freaked-out set but presented in a peaceful manner because atomic energy is, after all, our fiend friend. BALE, Bob. How To Make an Atomic Bomb in Your Own Kitchen (Well, Practically). New York: Frederick Fell Inc,. 1951. First edition. Octavo. 191,  pp. Cloth. Dust jacket. Image courtesy of Coconut Rose Rare Books and Autographs, currently offering this volume, with our thanks.